If there’s one thing we in the UK do well, it’s put on a good show. The London 2012 Olympic, Paralympic Games and the Cultural Olympiad were a shining example of our triumphs. Not for the first time, the best of the UK`s creative talent put together one of the greatest shows on earth. That is a heritage that goes back many decades including 1985, when Bob Geldof and Midge Ure rallied the great and the good of the music world to highlight the plight of Ethiopia’s starving, with the unprecedented Live Aid concerts, witnessed by some 1.5 billion viewers in 150 nations across the globe. My meagre contribution that day was to act as personal security to Bob, his family, and all the performers based in the Royal Box. Our theatres are the envy of the world and our festivals and live gigs are legendary, our Creative Industries truly shape global opinion beyond our small island. This we do by taking our indigenous natural talents and creativity to work in collaboration with others to bring dreams to reality. Since we started in 2008, with the help of our members, we have led the campaign to change recruitment culture in the sector, creating the first specialist apprenticeship frameworks. Now, over 2000 young people have benefitted from this opportunity, leveraging more than £7 million investment in training. Through our Creative Choices careers programme, we reach over 1.5 million young people online and engage 22,000 people annually in careers events and networking. With our dedicated research, data and analysis portal, Creative Blueprint, we have been able to inform and update the 66,000 creative and cultural businesses in the UK about the shape, skills, needs and gaps in the creative labour market. 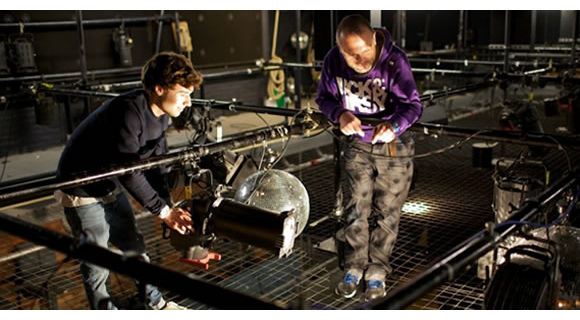 In 2012 we opened The Backstage Centre in response to industry’s call for technical skills in live music and theatre production. The dedicated training and rehearsal space, in Purfleet, Essex, offers young people the opportunity to train alongside industry professionals, and get real hands-on experience working backstage. In November, 2012, Arts Council England awarded £15 million to Creative & Cultural Skills to deliver the Creative Employment Programme (CEP). Specifically designed to open up long-term job opportunities for young people in the creative sector, it will create 1,600 Young Apprenticeships, 2,900 Apprenticeships and 2,000 Paid Internships for 16-24 year-olds between 2013 and 2015. To celebrate the launch of the Creative Employment Programme and other achievements, we will be bringing together leading industry authorities at our annual industry conference on 6-7 March, at The Backstage Centre. Our guest line-up includes, Matthew Hancock MP (Parliamentary Under-Secretary of State for Business and Education; Moira Sinclair, Executive Director London, Arts Council England; Michael Davis, Chief Executive, UKCES; David Way, Chief Operating Officer, National Apprenticeship Service. The theme for this year’s event is of course, ‘The Power of Collaboration’. It promises to be a damn good show.